Browse: Home / 2016 / May / Victory for the PCS National Museum Workers. The Visitor services staff of National Museum of Scotland members of the union PCS recently won a victory over their bosses after their long running dispute. This is Edinburgh Anarchist Federation’s statement of Congratulations. 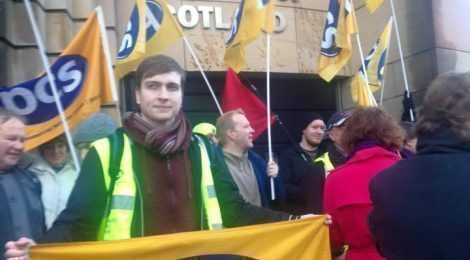 Edinburgh Anarchists would like to congratulate PCS Museum Workers at the National Museum of Scotland on their recent victory in their dispute with their bosses. After a long dispute going back years over the issue of unequal pay and weekend working, major gains have been won. Fair Pay at National Museums Scotland writes “Thanks to everybody who worked so hard over the years, and to those who showed their solidarity and support! ‘Following a breakthrough offer from management, PCS suspended the first three weeks of a planned six weeks of sustained, weekend industrial action. Members had been due to escalate their action from Easter until the Holyrood elections at the start of May. Intensive negotiations with management have been ongoing for the last 2 weeks, which led to an offer being made. Our members voted to accept an offer to put an end to the two-tier workforce and tackle low pay at the museum. Members will receive wage rises of between £221 and £1,634, with the lowest paid gaining the most. Most members will also get compensation payments of between £600 and £15,000, with an average of over £12,000 for those currently in receipt of the allowance. National Museums management has committed to further addressing the issue of low pay going forward. Overtime rates and shift allowances will increase and temporary workers will get first option of new permanent jobs, expected soon. This victory shows the value of organizing and that despite the nay-sayers today strikes can achieve great successes. Edinburgh Anarchists truly hope the Museum workers are satisfied with this result and these gains are in line with the aimed result.